Orthoptic support to joint Optometry and Orthoptic clinics for new and follow up paediatrics, Consultant led ocular motility clinics and general and specialised Ophthalmology clinics for adults and paediatrics. An Orthoptist deals with patients of all ages but has a particular interest and expertise in the very young and the elderly as these have a higher incidence of ocular pathology. Orthoptists detect defects in visual acuity, squints (strabismus), near vision anomalies and binocular vision anomalies in young children, which if left untreated can affect the development and function of the visual system. Orthoptists are specially trained professionals who identify, treat and give advice to patients who experience visual problems relating to head injury, stroke, neurological and degenerative neurological impairments, endocrine and systemic conditions, trauma to the face and brain tumours. These patients may experience many visual symptoms including double vision, loss of the field of vision, abnormal eye movements and difficulties reading or performing normal visual tasks. Orthoptists are Allied Health professionals (AHP’s) and are registered with the HCPC. We have a team of Orthoptists who specialise in assessing and treating children with special educational needs (SEN) and visual impairment who attend special schools and child development centres. It is essential that these children have any visual function problems detected as early as possible to ensure their learning can be tailored to their particular needs. Up to 80% of children with special needs have associated visual difficulties and the Orthoptists work within a multi-disciplinary team to maximise the potential of these children. We also assess and support children in mainstream school with visual impairment and work closely with the teachers for the visually impaired. Children who are not progressing at school and have difficulties with reading, writing and spelling can access our specialist team of Orthoptists in the Visual Processing Clinic. Children have their visual perception skills assessed alongside visual educational tests which identify any defects of visual processing which may be contributing to their difficulties at school. The Orthoptists work very closely with the SENCO, teachers at school, occupational therapy and education psychology teams to ensure children are supported with any visual therapy or advice that may help their learning. We provide a vision screening programme to reception class children in Warrington (children in the Halton area are screened by a different team). Early identification of reduced vision or binocular vision defects allows treatment to be effective whilst a child’s visual system is developing. There is a critical period of time in which treatment to improve the level of vision in a child must be undertaken before treatment is no longer effective and leaves permanent visual loss. This critical period is treatment before the age of 8 years old in most cases. Babies who are born prematurely or of low birth weight are 3 times more likely to have a squint, require glasses or have other visual problems than babies born at term. The Orthoptists assess these children to detect and treat any visual problems early. We provide an Orthoptic stroke service at Warrington Hospital. Every patient who is admitted with a stroke has a specialist Orthoptic assessment to detect any visual complications. Patients are seen on the ward, as an outpatient, care home or as a home visit for those who are housebound. Visit our Orthoptic Stroke Service by clicking here for more information. The Orthoptic department is a teaching department committed to clinical education for undergraduate orthoptists and provides clinical placements to students from the University of Liverpool. We provide Orthoptic led clinics at Warrington and Halton. 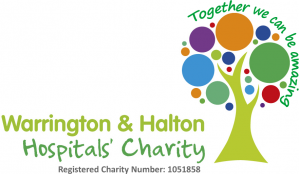 Visual processing clinics are held at Widnes ( Health care resource centre),Warrington hospital and Halton hospital. Currently all Consultant led clinics which require Orthoptic support are held at Warrington hospital. The Orthoptic teams visit all 69 primary schools in Warrington to screen children in the reception class as part of the visual screening programme. We have a team of 16 Orthoptists, three Orthoptic assistants and four administrators. Referrals are received into the department from GP’s, opticians, health visitors, school health advisors, SENCO’s, teachers, teachers for the visually impaired, rehabilitation officers, paediatricians, all other therapists and health care professionals. Referrals are triaged by a qualified Orthoptist and may be directed to an ophthalmology led clinic, Orthoptic led clinic, community clinic or to one of the specialist teams. Referral form in patient wards can be done via ICE. This map is a simple guide to identify key areas such as reception, waiting areas, refreshments, toilets, etc. Please click here to view.